UPDATE: On Saturday, October 10th, 2015 Governor Jerry Brown signed into law measures which will eventually make voter registration automatic for ALL California citizens who get or renew a California drivers license. The bill was a priority of newly elected Secretary of State Alex Padilla. 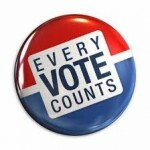 ALL voters registered in California are eligible to vote in ALL statewide elections. NO photo ID is required. The election date for the next National (Presidential) Election is November 2nd, 2016. THIS DATE IS SET BY LAW AS THE 1st TUESDAY AFTER THE FIRST MONDAY IN THE MONTH OF NOVEMBER. IT MAY NOT BE CHANGED. Polls in California open at 7AM and close at 8PM on election day.